Those weren't green sleeves he was wearing. I don't think I've ever seen nor heard of "The Ref" either. I hope everyone Do Be having a Divoon time at BK's Christmas Eve Do! I'm up, I'm up - after the sleep I so obviously needed. Wow (wow, spelled backwards). So, in just thirty minutes I'll begin slicing and dicing and mincing, oh my. I'm envious of your ability to sleep so well, and late, when you need to. DR Jane - I keep meaning to ask: Have you thought about installing blackout shades in your bedroom? Time to rest up for the arrival of my nieces and nephew. Tonight, the family went to my parents' house. We had much food to eat and many presents to open. We decided to exchange names instead of everyone getting something for everyone. I got Larry, my sister's boyfriend, and I got him the new Mark Twain autobiography (volume 1); a CD, The Barra MacNeil's Christmas Album II; and some coffee. My niece got me a couple of pictures...framed album-sized promo posters of The Manhattan Transfer's "Vocalese" album and Linda Eder's "Storybook" CD. They will look great over my piano. I also got some cash and a Subway gift card from my parents. And now, I'm home. 10:20 PM - Gtaham Norton Show with Matt Smith guesting. I didn't know about the Proms program or the Gtaham Norton Show! Thanks for the info! I'll be recording these.
" The best things in life are free "
Hope everyone had a wonderful evening. By the way, has there ever been a version of "Greensleeves" that actually includes the word greensleeves? My cousin from Oregon sent a package that arrived today and in the package was a jar of cranberry jelly from Oregon! 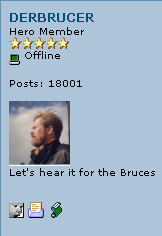 And Congrats to Der Brucer on his posting plateau! The Do is Done and it was grand. I think we had more people overall than ever before. So many, in fact, we ran out of chairs and some people were sitting outside by the pool. It was great fun, and just when it was starting to break up about twelve more people arrived, so the last of them left about fifteen minutes ago and I've started to clean up. I think the notes will go up late tonight, as I've got to sit down and relax for a few minutes. So many nice folks, some kids, our very own Mark and Amy and I'll have more of a list later.